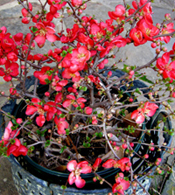 The bright blooms of flowering quince offer some of the first flowers of winter. These carefree pass along plants have graced Southern gardens for generations. They offer dependable color when few things are blooming. Place them in a spot with full sun and well draining soil. Any kind of garden urn or planter will work since they are so colorful they will compliment all types. Terracotta, poly resin, glazed ceramic or concrete. Avoid shearing the branches, instead, remove some of the older canes at soil level each winter. Force branches into bloom by cutting stems just as the flower buds start to swell. Place the branches in a vase of water, and put them in a cool room to coax the flowers to open. Nice! Right now when there seems like there isn't much to do in the garden or patio area you should take another look. You have lots of choices for fragrance in the winter garden. Shrubs such as paper bush have lightly fragrant blooms. Winter honeysuckle offers a familiar sweet scent. Winter daphne is an elegant evergreen with powerful fragrant blooms; you will actually want to go outside just to smell the flowers. Potted Wintersweet offers delicate blossoms and a spicy scent. Place them near entry points into your garden or along paths to best enjoy their perfumes. Look for them at your local nursery or online. 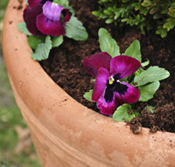 The cold weather can take a toll on potted pansies. Remove spent blossoms and trim any leggy foliage with scissors. Water the plants well and let them drain. Then use a liquid fertilizer to feed the pansies. 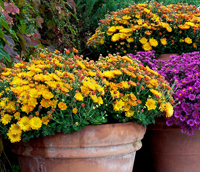 You can also add new plants to your garden pottery to replenish pots or just to add a bit of extra winter color. Collards and kale are perfect additions to your winter pottery and table. Gather leaves to steam, stir fry or add to soups. The cooler winter weather actually sweetens the flavor of the leaves. Harvest regularly from your pots by pinching off the leaves from the bottom up so the plants will continue to grow new ones. 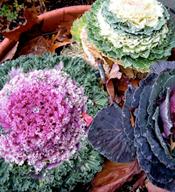 The colors of these cabbage plants will compliment any pottery or garden design you are trying to achieve. Now is the perfect time to start planning your spring garden. Purchase seeds early for the best selections. Check our your current garden planters for cracks or any damages and see what will need to be replaced or added to. The whole idea is to have fun, dream and plan and you will be guaranteed a wonderful yard and patio next Spring and Summer. Read more.....Cold & Warm Season Veggies in Pots!